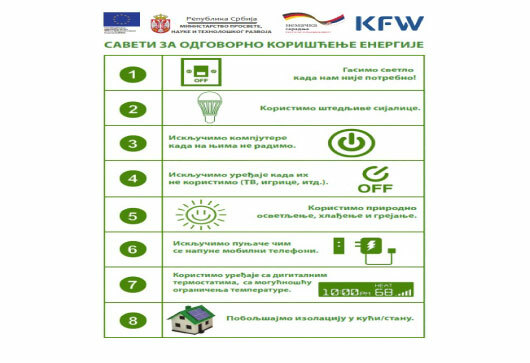 Project “Energy efficiency in Public Buildings” – EcoDev implemented the information campaign for teachers, pupils and parents about the project „Energy efficiency in Public Buildings“, which was supported by the Ministry of Education, Science and Technological Development of the Republic of Serbia, the German Development Bank (KFW), The German Society for International Cooperation (GIZ) and the Western Balkans Investment Framework (WBIF). Results of the project: Educational workshops were organised in five schools that were included in the project (Elementary schools: „Moma Stanojlović“ in Kragujevac; „Vuk Karadzić“ in Knić; „Vojvoda Mišić“ in Pecka; „Branko Radičević“ in Mali Zvornik and High school „14. Oktobar“ in Kraljevo). The aim of the information campaign is to convey basic knowledge about ecology, sustainable development, various energy efficiency measures, as well as to explain the role of teachers, pupils and school staff as the school building users in their contribution to energy savings.